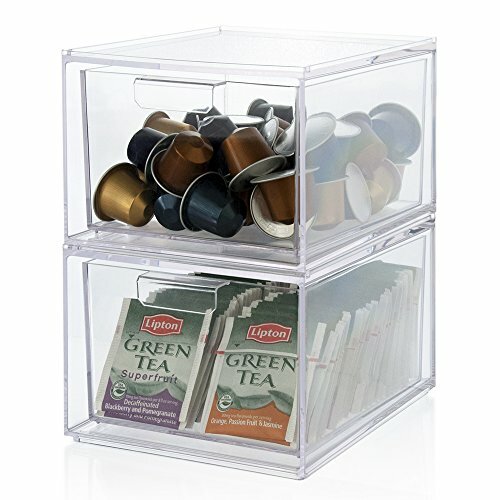 Need a place to stash all those coffee pods and tea bags that are constantly cluttering drawers and getting lost in the pantry? These organizer drawers are the perfect solution. They hold any size coffee pod and look great next to any coffee maker. Drawers can be used side-by-side or stacked to save space. Also a great storage solution for all those little taco seasoning and gravy packets as well as hot chocolate packets. The clear design makes it easy to see what flavor pod you are choosing. Each drawer removes completely for easy refilling and cleaning. Made in USA. If you have any questions about this product by STORi, contact us by completing and submitting the form below. If you are looking for a specif part number, please include it with your message.